This thread is for comments about our Big Bad Wolf guide for One Night in Karazhan. One Abomination is enough to foul the AI after it losed its three Grannies not to attack. But don't play a secound one. If you run 2 copies of Abomination, you have a higher chance of drawing it. That's why it's included twice. Moat Lurker, which I believe you get from one of the previous bosses of this adventure (Normal or Heroics, not sure), is incredibly useful for this Heroic fight. It kills a minion, and then when it dies, resummons that minion. Best part is, the resummoned minion is back to full strength. I used it to kill my Piloted Sky Golem, get a free 4-cost minion from the Deathrattle, and then when Moat Lurker died, I got back a 6/4 Sky Golem. =) Sylvanas Windrunner would be another great target for this card, or any powerful Deathrattle minon for that matter. It pretty much single-handedly won me this fight, so I hope it helps you! Mysterious Challenger into Tirion into Divine Favor & Murlocs, he didn't have a chance. Peacekeeper, Apothecary and MC Tech turned out to be pretty useless, I cleared his stuff so easily. That deck actually belongs to the wolf. The deck even contains an uncollectible weapon, Big Bad Claws, which should make clear that it is the wolf's deck. I did not try paladin, but I found luck with one of my shaman decks. Morgl triumphed with just one attempt. Didn't have enough of the cards in the guide to do this with Paladin. Took a few goes but got it with the constructed Barnes-YShaarj Hunter deck. Nice one. Do you mean the one from our site? If so, here is a link to the deck. Yes, that deck. Have been playing it a bit in constructed. 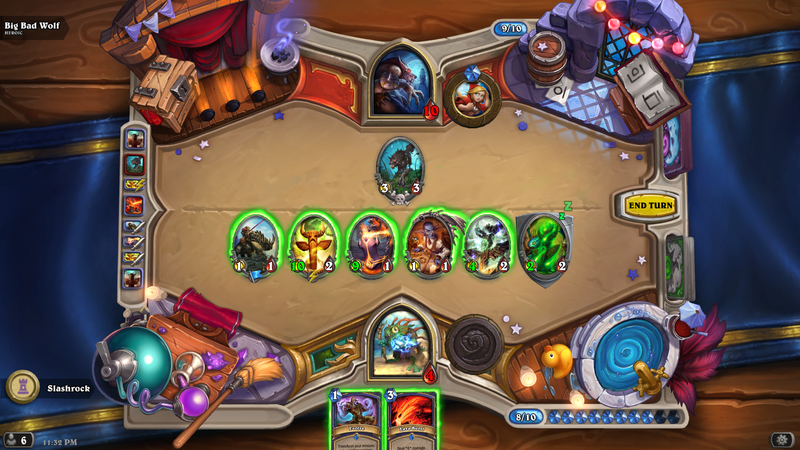 Just keep restarting until you have turn 1 Barnes. That cancels out his starting advantage, then stall until Call of the Wilds. Explosive Trap was pretty useful if I recall right. Very cool. Glad to hear people finding new ways to beat it from the site! Thanks also for giving some pointers for those that might try it. Jade cards still ramp, and minions with battlecry that summon other minions work just fine, e.g. big-time racketeer. I did heroic with Druid using standard Jade, big-time racketeer, wobbling runts, ancient of war, cenarius, ragnaros, etc. Hogger was also quite useful. Thanks for pointing this out! I tested it and it turns out this goes for other cards that are tokens as well (Wrath, Raven Idol, Druid of the Claw...), and Damien is investigating it already. Thanks again for pointing this out!